On a beach somewhere, sand between my toes, salt on my lips and the sea breeze teasing my hair, I’m lulled into a gentle somnolence by the blue rhythm of the waves. A tall, cold glass, a meaty slider and a book keep me company and I don’t know what time it is. Truth is, I’m in the middle of a heatwave, bored by chores, plotting an imaginary escape plan. I do that sometimes, don’t you? When reality bites hard, we all seek a cloud to float away on. But I tire quickly of too many clouds floating away, leaving me behind. The heat, I realise is shutting me down – making me complain about the weather and stifling my spirit. I need to cook something I could eat on that beach. Maybe a slider since I was daydreaming of one. That tall, cold glass can still be had and once that is arranged, it works exactly like a pacifier. Calmed, I think why not do something fun and make two types that are not to heavy and that can be eaten warm or cold, in the garden, by the pool, under a tree or in front of the television, using only my fingers. I’m not in the mood for clattering cutlery when drops of sweat are drag racing down my spine. Sliders sound good – compact and easy. A simple but super pragmatic invention, sliders don’t leave you feeling stuffed like burgers do, and yet they deliver that full bite of something meaty or veggie with all the relishes and toppings in one compact package. Frozen peas are every cook’s best friend; always available at short notice.My menu includes a pea, Parmesan and feta slider and a fried chicken and mango one, both jazzed up with a yoghurt spread(instead of mayonnaise) and caramelised onions. Mango and chicken have terrific chemistry, the yoghurt spread works as the garlicky creamy base and as for caramelised onions,put them on a boiled shoe and I’ll gladly devour it. 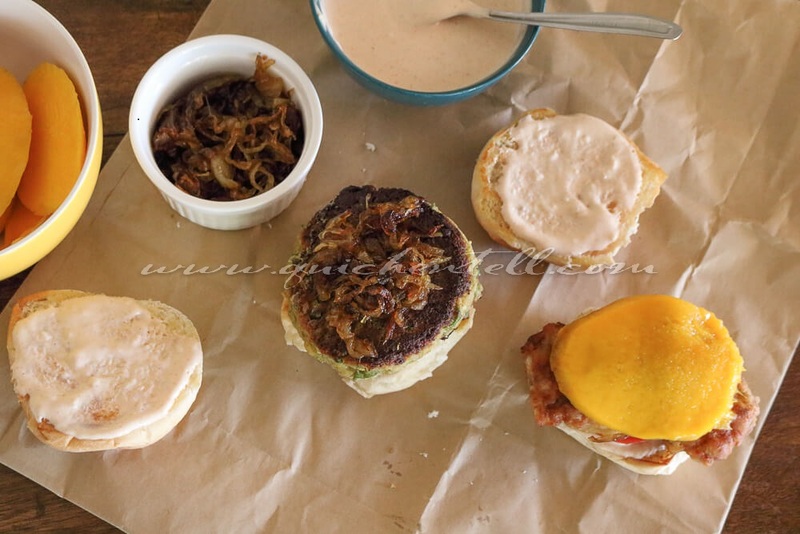 I made everything fresh but both sliders can be prepped a day earlier; in fact the caramelised onions and the the spread can be made up to 2 or 3 days in advance. It would be perfect to get things ready on a Friday so that on the weekend you could do a relaxed, no-stress lunch. To complement the peas in the patty; to make it more that just mashed peas, I add some Parmesan and feta but these can be easily substituted for any of your 2 favourite cheeses (or even 1 would work fine). Just remember to use medium to hard cheeses because a soft cheese would make the patty loose and difficult to handle. They can be shaped the night before and refrigerated; and are so foolproof that I’m planning to serve bite-sized versions as finger food at cocktail parties. The chicken slider has de-boned chicken thighs (they are juicier and more flavourful but breasts are also fine). Make sure to cut the thighs or breasts into a size that will fit into a slider. You don’t want the chicken slipping out while eating. My chicken marinated for a couple of hours with salt, black pepper and red chilly powder but overnight would be better if you have the luxury of time. Casual, hip,fun and easy, these sliders are just what the doctor ordered. They are excellent for casual get-togethers, picnics, lunchboxes, and even road trips. They are versatile – you can put almost anything in them and kids love them, especially if you get them to assemble them. Now time to lay back, get another tall cold glass, get some mango juice on my chin and slide happily into a food coma. A creamy, pea and cheese slider and a crisp fried chicken and sweet mango slider served with caramelised onions and a garlicky yoghurt spread. 300 g Greek yoghurt or hung yoghurt Hang about 600 g plain yoghurt in a muslin cloth placed in a sieve for 4-5 hours in the fridge. The result is a thick, creamy, spreadable yoghurt. Roughly mash the peas - half of them should retain their shape( you don't want a homogeneous pea mash). Mix in all the ingredients well, except the oil and shape into 1.5 cm-thick patties. Place on a plate and chill for 20 minutes. Pour enough oil into a non-stick or cast iron pan to a height of 1 cm and heat till quite hot. 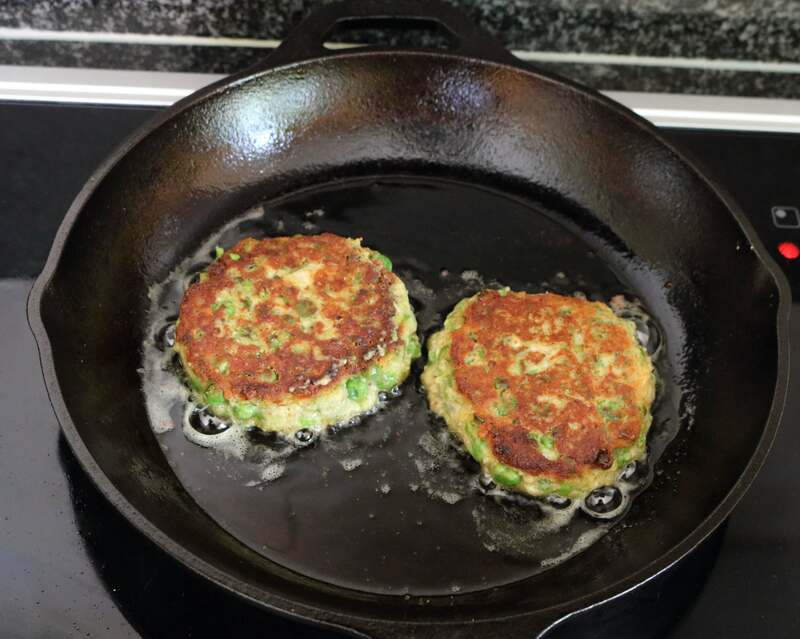 Gently place the patties into the pan (2 at a time) and fry for 2 minutes on each side or until both sides are browned well and crisp. Drain on kitchen paper and keep warm in the oven while you fry the rest. Marinate the chicken with the chilly powder, salt and pepper for a couple of hours in the fridge. Dredge the chicken in the flour, shake off the excess flour and dip the chicken in the buttermilk. Once again dredge in the flour, shake off the excess and place chicken on a plate in the fridge to chill for 20 minutes. Heat a couple of centimetres of oil in a pan on medium flame; drop a small piece of chicken in, if the oil must bubbles, it's ready. Fry the chicken for 2-3 minutes on each side till golden and crispy. Take care not to overcrowd the pan or the chicken will steam and will not crisp up. Drain on kitchen paper and keep warm in the oven. Heat olive oil and butter in a pan on a medium flame and throw in the onions. Fry the onions till transparent, then add the brown sugar and continue to cook on medium heat, till the onions give up all their moisture and slowly start becoming golden. Now add the balsamic vinegar if using. Either way, keep cooking and keep a close watch. when they turn a deep caramel in colour, they're done. Mix all the ingredients into the yoghurt to make a thick, creamy spread. Season as desired. Heat a griddle and smear lightly with oil/butter. Lightly toast the 2 cut halves of the buns. For the Pea, Parmesan and Feta slider, spread the bottom half of the bun with the yoghurt spread and place a tomato slice with a pea patty on top, followed by the caramelised onions and lettuce. Smear the top half of the bun with the yoghurt spread and close the slider. 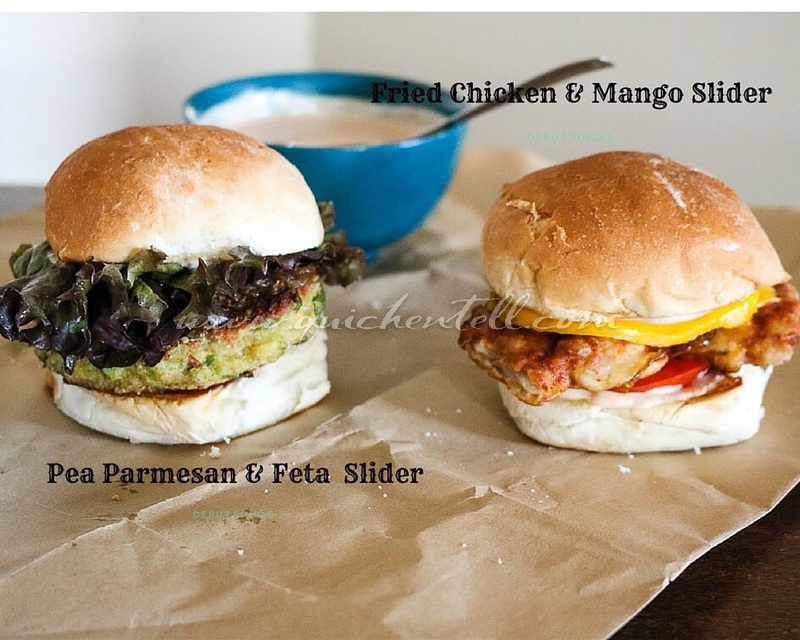 For the Fried Chicken and Mango Slider, spread the bottom half of the bun with the yoghurt spread and place a tomato slice with fried chicken topped by a slice of mango and caramelised onions.Smear the top half of the bun with the yoghurt spread and close the slider. Preparation time does not include marination and chilling time.